Charlene kicked start the South Arm Community Kitchen for 2009 with two recipes. Also, Charlene is working with Family Services to start up a few more seniors kitchen which had been a roaring success last year. We wish her the best in her new role. 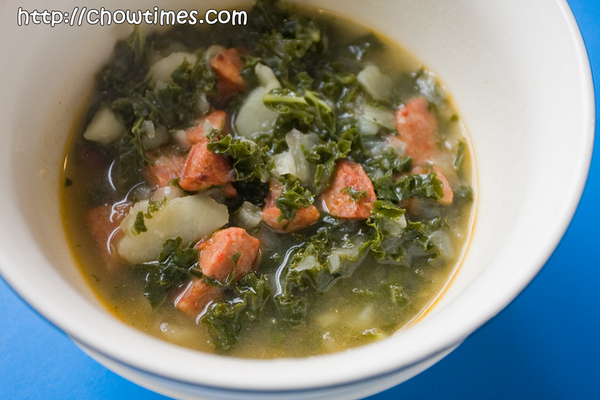 Back to food … the first dish which Charlene demonstrated is called Portuguese Kale and Chorizo Soup. 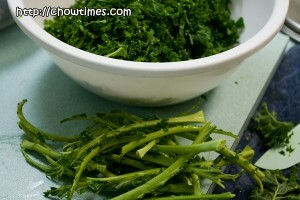 Kale is a very nutritious vegetable which is not common among Chinese. 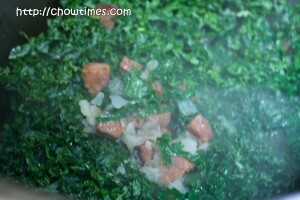 I had blogged about Kale’s nutritional values in this blog. This is a hearty soup complete with protein, carbohydrate and fiber all in a pot. It is great for cold winter days. Wash the kale. Strip the leaves from the stem and discard the stem. Pile a few leaves together and thinly slice. 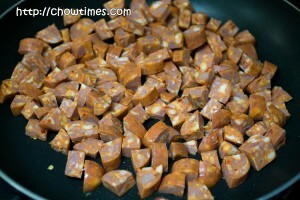 In a large non-tick frying pan, pan fry the Chorizo cubes over medium high heat, stirring occasionally, until browned, about 5 minutes. Transfer to a paper towels lined plate to drain the fats. 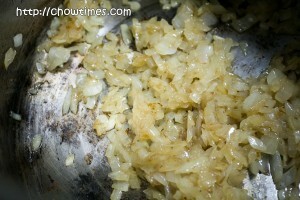 Cook the onion in olive oil in a large pot over medium heat until golden brown. 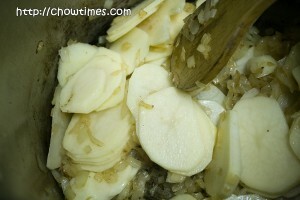 Add potatoes and cook, stirring occasionally for about 4 minutes. Add water or chicken broth (or a mixture of both) and season with salt to taste and simmer until the potatoes are very tender, about 15 minutes.Use a potato masher to coarsely mash the potatoes in the pot. 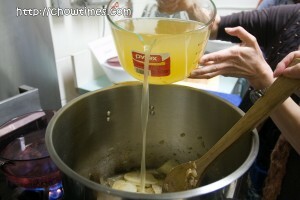 This helps to thicken the soup. 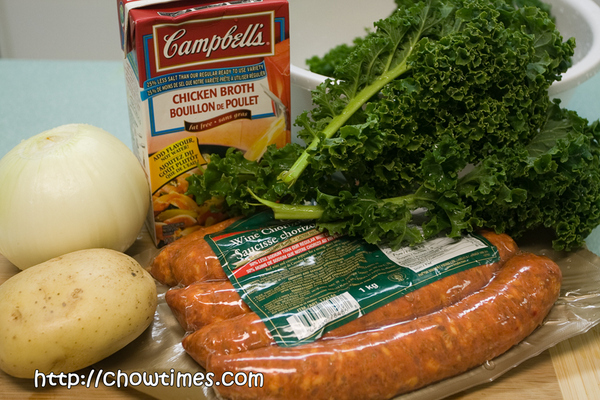 Stir in the chorizo and kale and simmer until the greens are tender, about 5 minutes. This recipe is adapted from Gourmet and it serves 6. Many versions of this soup include a can of white kidney beans, added at the very last, just to warm up. Caldo verde is one of my favourite soups! A great winter soup — can be made with local ingredients, and kale is so good for you — high marks for this soup all around. Thanks for sharing. Suanne, excellent, re the pictorial representations and the clear instructions as to the various stages of the cooking process. I always like putting greens in my soup and this one looks delicious.